Using Vinegar and Baking Soda to Auto-Clean the Dishwasher Review – Does it Work? Vinegar is an amazing green tool. With its ability to disinfect and its low cost, vinegar an ideal leader in your home cleaning toolbox. It can wipe out mildew, remove limescale, soften your laundry, kill your weeds, and capture your fruit flies. Baking soda is another powerful tool. Combined with vinegar, baking soda can take stains out of your mattress, and scour your counter top. But can vinegar and baking soda quickly and easily clean your dishwasher when added to the cycle? Saves Money – vinegar and baking soda are cheap, cheap, cheap! Easy – putting a cup of vinegar and sprinkle of baking soda in the dishwasher and running the cycle couldn’t be easier! My dishwasher is a little gross. It’s rather mildewy around the edges, and never seems to quite dry out between cycles. Meh – we live in a rental, so to some extent this kind of thing comes with the territory. The yucky spots are deep in there and hard to reach, and I always seem to have two little ones under foot making everything I do more complicated, so I haven’t gotten around to cleaning it. I figure the dishes never touch the mucky parts, and we do the heated dry at the end, so no real cause for concern.. So you can imagine my joy when I came across the promise of an easy way to clean your dishwasher. Just add a bit of vinegar and baking soda to the load, and you end up with a sparkling dishwasher. I put a big bowl of white vinegar onto the top rack, and ran the cycle. It didn’t work. At all. Hey gross mildew! Why are you still there? I figured I must have screwed it up. I went back, and carefully re-read the instructions. Realizing I’d just skimmed through the first time, I decided to try again, this time exactly as instructed. I sprinkled baking soda on all the mildewy spots, put a bowl of vinegar on the top shelf, and ran on the hottest setting. I’m so sad! I hate it when Green Ideas don’t work. I’m glad it worked for the NZ Ecochick, but it did not work for me. Not even a little bit. So what did I do? I got out my scrubby sponge, and vinegar, distracted the kids with shucking corn on the cob, and easily wiped the mildew out. It was even easier than the time I wiped out mildew in the shower. Vinegar (with a little elbow grease) wins again! What’s your favorite vinegar trick? Do you have other suggestions for an easy dishwasher clean? 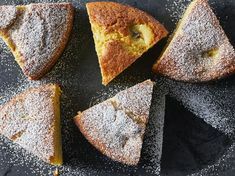 This entry was posted in Baking Soda to the Rescue, Cleaning, In the Kitchen, The Power of Vinegar and tagged baking soda, better for the earth, cleaning with vinegar, Green Idea Fail, kitchen, vinegar. Bookmark the permalink. 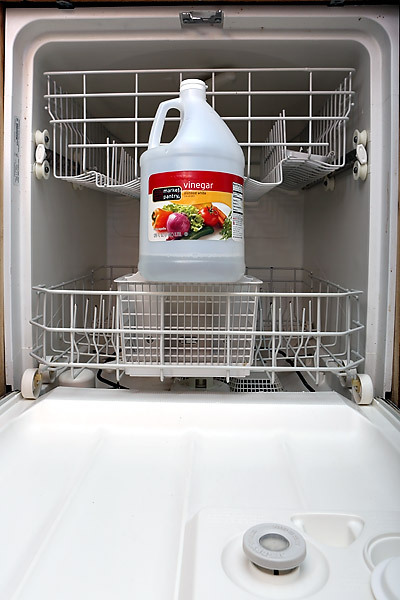 45 Responses to Using Vinegar and Baking Soda to Auto-Clean the Dishwasher Review – Does it Work? Love your blog. I became a follower to keep up with your latest posts! Thanks. Thanks Debi, I’ll check it out! Vinegar is the cure all isn’t it! Darn! I was hoping it would work. 🙂 Oh, well… I guess I’ll have to clean mine the old fashioned way, LOL! Thanks for posting this even though it didn’t work! Keep up the fabulous posts friend! I heard of Tang for cleaning dishwashers. I have done the tang trick and it does work. I think if you throw in some Kosher salt with the Tang it may help in the scrubbing. But, I use vinegar all over my house. My favorite is using it as a rinse agent in my laundry, and NO it does not make my family smell like walking pickles. I also use it as a rinse agent in the dishwasher. We make our own automatic dishwasher detergent and last month my hubby thought that regular table salt would be an okay substitute for the kosher salt in the recipe…NOT. All of my dishes for a month had a funky film. This month we made it the ‘right’ way and added a little extra vinegar to the wash cycle for the first few days and that film is gone and the dishes are back to being sparkling clean again. Thanks for all these great tips Camiel! I use vinegar on my laundry rinse cycle but it definitely leaves my clothes smelling of vinegar! Hi becky – I had that same problem when I first tried. I think you might be adding it too late to the rinse cycle. You want to add it to the rinse as it is first filling up, not as it is spinning and rinsing. Or adding it to your fabric softener dispenser works well too. Thanks Madeleine – I love what you’re doing! Thats too bad, I love vinegar too. To clean my dishwasher I use 2 packages of lemonade kool aid. It works quite well! I was told not to use tang because it has sugar in it and sugar grows bacteria. Love your blog!! Lemonade Kool-aid? I suppose the citric acid does the job? I may have to try a round 2 on the dishwasher cleaning test. There’s still some gunk in the drain I couldn’t reach with my scrubby sponge. Love the blog and the comments. I heard that a bowl of vinegar outside will keep the moquitoes away. Does anyone know if that will work? Interesting! As I am the world’s most attractive mosquito target, I could easily test this one out. Thanks for the idea! Hah! I feel the same way about mosquitoes! I always feel like I’m donating blood when I’m out in the summer. I had a similar problem, I just put about a quart of straight vinegar in the d.w. (not in a bowl, just in the bottom of the machine) and ran it on “normal” cycle. I stopped it for a few hours in the middle, then let it run through. That seemed to work. I didn’t use “super” or “heavy” load….just plain old “normal”. I’ve used Tang (that fake orange-ade scary nasty powder) with great success to get the DW sparkly clean. Okay, okay! Enough people have mentioned Tang that I think I have to try this! There’s no reason it should have worked with vinegar sitting in a bowl in the top rack. Next time add the vinegar to the baking soda directly and let it sit for 20 minutes, and then turn on the dishwasher (without dirty dishes in it, of course). Thanks for the tip Cathy – I was reviewing the idea as it was presented to me. It certainly makes more sense to combine doesn’t it? I’ll have to try it out again! I just tried it out, and it worked perfectly. I did have to go in with a sponge first and remove all of the heavy grime, but after that, the vinegar and baking soda cycles made the rest sparkle! Thanks for the tips Jasen – I may have to try this out again. The dishwasher in my rental was horrendous so I put white vinegar in the Jet Dry spout. You have to do this repeatedly in order for this to work. And if you take a spray bottle filled with vinegar and spray the inside of it after each use, it will help break down hard water and scummy goo in it as well. You can also spray white vinegar in your shower after each shower. It is the best hands down I have ever used to get rid of limescale. Thanks for your thoughts, Cheryl. I added vinegar to my Jet Dry reservoir on a whim a while ago. Now that you mention it, the scummy build up HAS been looking better lately. Another gold star for vinegar! Try adding the vinegar 15 minutes after the dishwasher started. I’ve read on other blogs about using vinegar in dishwashers, that putting it in your rinse aid receptacle is NOT a good idea because it could potentially damage rubber gaskets or anything similar in that area. It might be a better idea to just put it in a small container on the top rack when it comes time for your rinse cycle. Ha, I have the same dishwasher with the same problem!! I also tried baking soda and vinegar to no avail. Sure it made it real easy to wipe off what I could reach, but I wasn’t satisfied with that. Have tools, will disassemble! 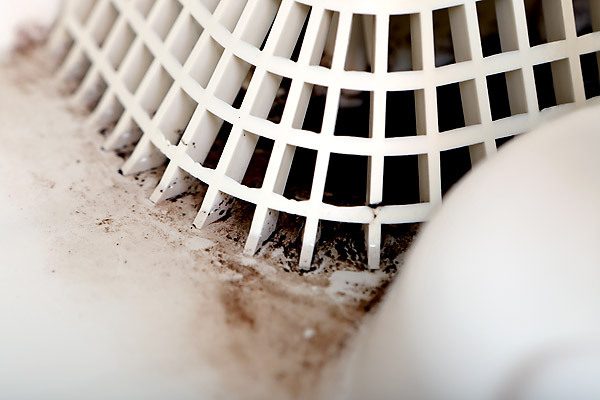 OMG, what is under that filter basket will make you sick! LOTS of thick hairy mold. It horrified me that water that touched this was rinsing my dishes! So into a bucket of diluted bleach water went every piece I could reasonably remove. Once everything was clean and reassembled I still have a problem of a little standing water in the bottom. So after I’ve unloaded the clean dishes I start a new cycle and then cancel it quickly and it drains some more water. It’s not perfect, but between the detailed clean and the extra drain the mold doesn’t reappear as quickly. But I cannot wait to reach it and all drainage plumbing between it and the disposal! Whoops, can’t wait to replace it! Doesn’t combining baking soda (base) with vinegar (acid) simply neutralize them both? Every three months or so, I close the detergent cup in my empty dishwasher and start a normal cycle. I hang around twiddling my thumbs until I hear the cup open, then immediately dump in a quart of white vinegar and let the machine run through the normal cycle. I started doing this because I was having a problem with the built-in dirt sensor constantly adding unnecessary pre-washes. G.E. service was no help but I finally figured out after a little web surfing that my problem was the gel type detergent I was using. It had begun leaving crud behind on the dishes and, I realized in a rare moment of ability to connect the dots, was apparently also leaving crud behind on the sensor, which then thought the dishes were dirtier than they really were. I still haven’t found a truly green dishwasher detergent that works. In my case, I eventually realized that G.E. had put a Cascade Complete logo on the detergent cup because that’s the only stuff that will fully dissolve and clean the dishes in that machine. Anyway, even though I’m no longer using a gunky gel type detergent, I still do the vinegar cycle every few months. I think I wind up with less crud down by the door hinge (the only place that machine seems to collect gunk) and what does collect there is easier to clean up. I like your idea of adding straight vineger to the wash cycle. I will definitely have to try it out. Thanks! I tried something similar in my dishwasher, and while it didn’t get rid of all the muck, it did leave it smelling fresher! Perhaps the style of dishwasher matters? Mine, while not new, is maybe five years old and definitely does a better job than my old dishwasher! Bottom line for me: I will use it for a quick refresh of my machine, but it won’t replace scrubbing for the tough stuff. BTW, thanks for such a great blog! I use a little a bit of bleach in the bottom on the machine before I start a load you can put some in and let it sit over night to. Vinegar and baking soda make a wonderful fizz, but when the fizz stops you basically have salt. vinegar is a natural deodorizer. the peroxide and baking soda make a safe soft scrub. I found the vinegar alone in my dishwasher was better than the mix. Myth #3: Baking Soda and Vinegar are a dynamic duo of green cleaning power! This myth is a relatively new one to me as well! I mean come on, looking at that amazing fizzing action – that has to be an equally amazing natural cleaner, right?